"The power is here, the time is now." 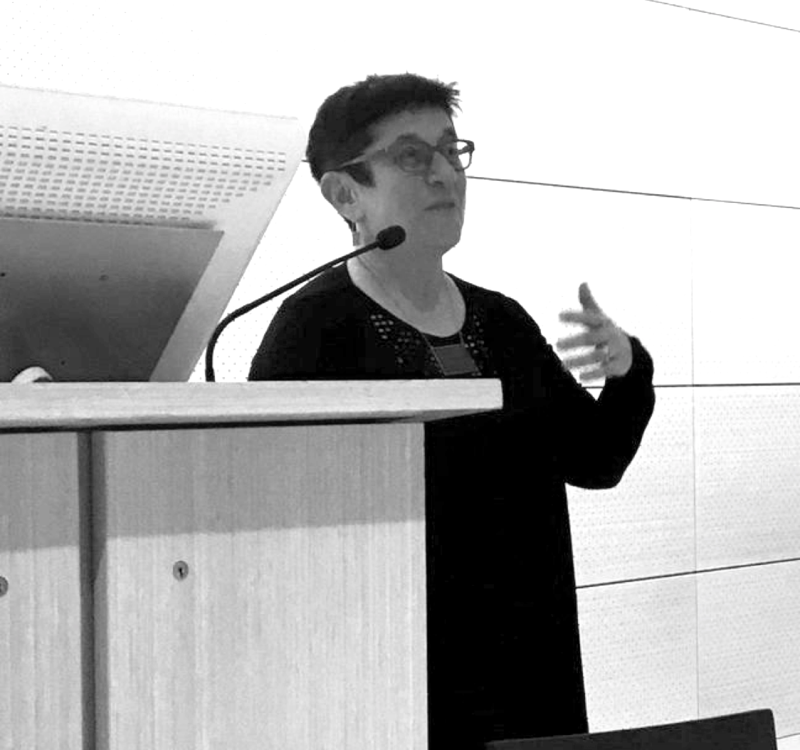 On March 20, 2018, the New School launched its Digital Equity Laboratory. 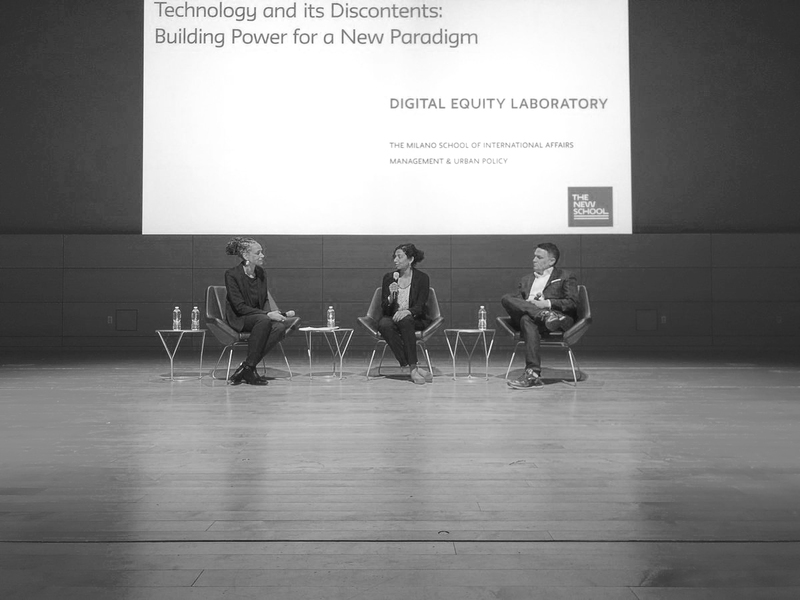 The Laboratory, housed at the Milano School of Policy, Management & Environment, uncovers and addresses structural inequities that persist and evolve as technology transforms our cultural, social, and political systems. Over 200 advocates, academics, government actors, and allies attended the launch to move together towards a positive vision of a more equitable digital society that is inclusive, accessible, safe, secure, and allows all of society to innovate fairer social and technological outcomes. Participants included digital rights and civil rights advocates; librarians and information experts; experts in artificial intelligence, algorithmic decision-making, and other emerging technologies; community organizers; community network builders; scholars, researchers, and students; civic technology leaders; municipal leaders; and technologists. It was an honor for the DEL to host such a diverse, cross-sector group of leaders and doers who brought breadth and depth of knowledge, fresh ideas, curiosity, and enthusiastic and positive energy, moving beyond cynicism toward collective power and engagement. Following is a summary of the proceedings, discussions and insights, and goals and priorities shared throughout the day. Download the full report here. We are in a catalytic moment for digital equity. The administration in Washington’s reversal of Net Neutrality and the 2016 FCC privacy protections (and the Congressional Review Act in the Senate reversing the reversal) -- alongside big data ethics scandals in the headlines, debates over fake news, and concerns about the ethics and market power of tech platforms -- have started a public conversation. We have an opportunity to build from here to achieve concrete outcomes. By strengthening our relationships with each other, and by expanding knowledge and awareness of these issues across communities, sectors, fields, and disciplines, we have the power to shift the dynamic around technological advancement: to flip the script from paranoia to power, from exploitation to consent. This is critical as networked and data-driven technologies transform our public and private spaces, and the nature of work and everyday life. Critical moments for action are here: municipalities are implementing algorithmic decision-making and smart-city systems; the mostly-online 2020 Decennial Census approaches; New York City will renegotiate its telecommunications franchise agreements in 2020; and woven throughout is the ongoing battle over regulation of the internet and digital platforms. Building digital equity is a long term commitment -- especially from the point of view of the current moment in which we have seen recent victories for digital equity reversed. To rebuild from here, and to leverage the current critical conversation as a catalyst, there is a need for investment in people, tools, policy, and research. 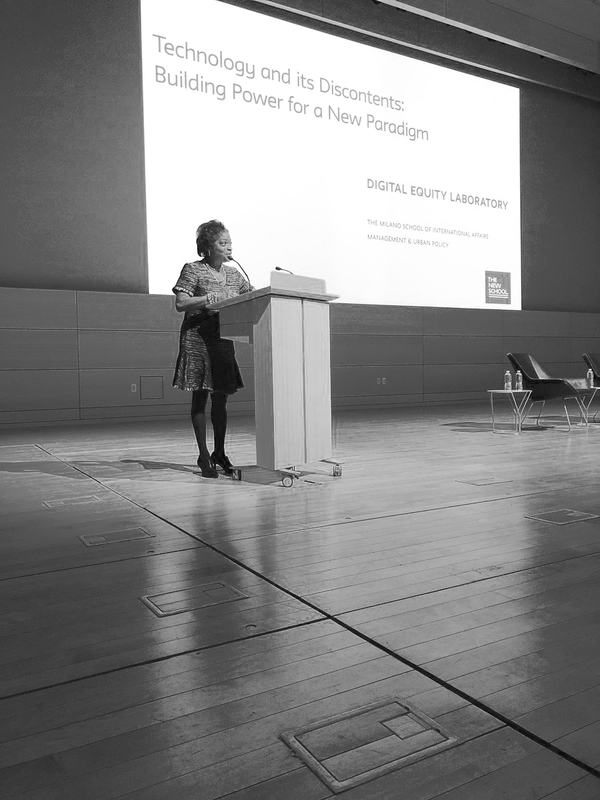 The Digital Equity Laboratory is a transdisciplinary center at the New School, housed at the Milano School of Policy, Management & Environment. Digital equity is a positive vision that advances equitable innovation and reverses the digital risks and harms that disproportionately affect communities of color, immigrants, and other vulnerable populations. We believe in a collaborative model and work closely with stakeholders, including community groups, local government, advocacy organizations and academics. We believe that everyone can and should work toward digital equity. It doesn’t require being a technologist -- and many of us and our partners are not. We are specialists in understanding the structural underpinnings of inequity, particularly along race and class lines, and the role that technology plays, both good and bad, in communities of color. We also believe strongly that solutions driven by digital equity are solutions that help society as a whole. We work through projects, applied research, technical assistance, and convening to build collectively the analysis, intervention points, experiments, policy solutions and alliances that will move the country toward equity through digital equity. We also teach so that our graduate students from across the university can engage in digital equity and form the next generation of leadership in the field. For the DEL, the formal launch through the symposium is a continuing project of collective idea generation and a deepening and broadening of our working relationships across, geography, identities, issue areas, and expertises. As a society we are just beginning to appreciate and grapple with the consequences of the advance of networked and data-driven technologies. Yet these dynamics do not arise in a vacuum; they are shaped by the same forces that produce and reinforce other social dynamics. Technology is an expression of our culture and society, and it also shapes us. Currently the array of digital equity challenges seems overwhelming: news about manipulation of elections and the privacy violations embedded in the market for big data; the loss (and almost-semi-return) of the Open Internet Rules and Privacy Rules; the lack of safeguards in platform and media consolidation; the potential loss of Lifeline and other broadband access programs -- all have profound implications for vulnerable groups, and could move us back decades in the long fight for digital equity. It is clear that we are in a moment of threat to the vision of a just digital society. Alongside our interrogation of emerging technologies, we must continually ask ourselves and each other what we are not yet paying attention to, especially as systems scale. How can emerging systems be designed, leveraged, and governed to benefit all, and not to place an additional burden on communities that have traditionally been marginalized, surveilled, and oppressed? These are questions that play out in governance, physical infrastructure, media, and economies. At the Digital Equity Lab, we feel it is critical to raise up questions of accountability and risk, in addition to promoting equitable benefit, in the development and implementation of new technologies. Keynoting the DEL launch, FCC Commissioner Mignon Clyburn asked participants to consider the reasons to fight for digital equity, and the forces arrayed against us. Threats to Net Neutrality (a free and open internet), to regulatory privacy protections, and to the Lifeline program (the federal subsidy program for low-income people to pay for telephone -- and under the previous administration, broadband service), are real threats to digital equity. It is clear that we are in a moment of threat to our vision of a just and equitable digital society for all. Commissioner Clyburn warned that among those who are reversing the work done to address the digital divide – the lack of internet access and the devices needed to get online – over the last two decades, there is a single-minded dedication to deregulation of the market that can lead to a deep lack of awareness and curiosity about the human consequences of retrogressive policy decisions. Yet in examining this moment, it is also clear that we also have an opportunity to build, and an imperative to do so. Commissioner Clyburn provided us with a rallying call: the power is here, the time is now. 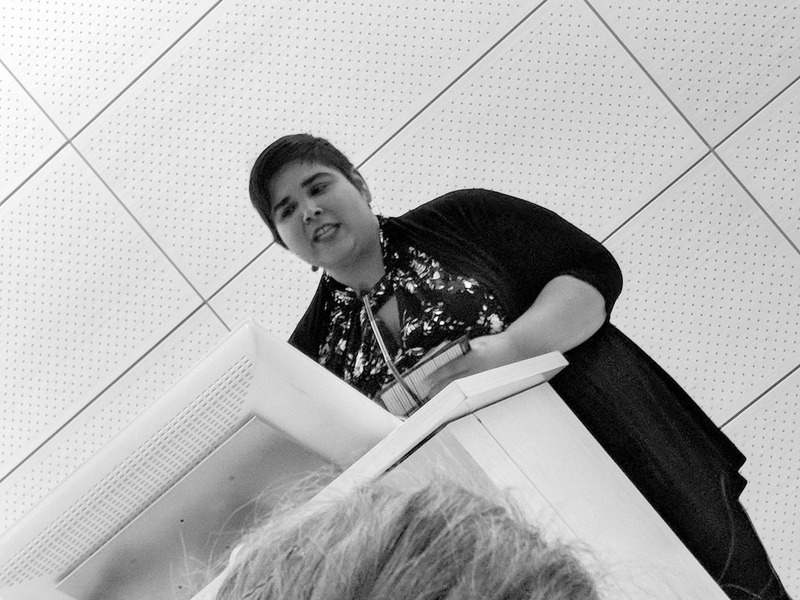 As a demonstration of the ability to build and govern around digital equity goals, Shireen Santosham and Miguel Gamiño offered a view into their work at the municipal level in San José and New York City. We are witnessing the rise of cities and municipalities in the current environment -- yet cities are still grappling with the digital divide, especially in “new majority” cities. So municipalities are starting to organize with each other for collective power, including a collective pledge – led by New York City – to take local action to protect net neutrality as well as digital privacy, access, safety, and health. Thus with the loss of advocacy at the national level, cities wield new committed leadership for digital equity in the current political moment. Part of this work is finding different kinds of partners to build digital equity, from different sectors, not limiting cities to dependency on the telecommunications sector. Both Gamiño and Santosham spoke of forging new partnerships with the private sector, from NYCx’s “Moonshots” competitions for private-sector broadband innovations to San José’s open calls for local makers and innovators to bring start-up energy into city processes. Gamiño and Santosham argued that cities must not rely only on internet service providers to help address digital needs; rather, cities and municipalities should forge different kinds of innovative partnerships to infuse both public and private sectors with concrete progress towards shared goals of inclusivity and progress. It was clear from these discussions of broadband equity at the national and city levels that technology leaders in the public and private sectors -- and public interest advocates, scholars, and practitioners -- are beginning to work together to shape a different positive vision of technology and its consequences in the world. They are interrogating technological systems and continually asking how these can be designed, leveraged, and governed to benefit all -- to be accountable, and not to place an additional burden on communities that have been unfairly marginalized, surveilled, and targeted. Santosham and Gamiño made it clear that for cities, innovation can mean using digital technologies and challenges as opportunities to innovate around social outcomes, not just technological progress. In his lightning talk, Andrew Rasiej underlined that creating digital equity, and the kind of infrastructure that can support it, is a long game. Throughout 15 years of broadband advocacy, we have seen increasing understanding of the importance of broadband infrastructure -- starting from almost zero. Even so, there is still not enough demand on public officials from digital equity advocates to create a truly healthy and equitable digital public sphere. Rasiej challenged us to expand our notions of civic life -- what we expect in our offline world -- to our online communities. We should be accountable in the same ways to each other online as offline, including but not limited to demanding the kind of physical infrastructure that can support equitable digital access and participation. Opportunities to take a public and accountable approach to creating the internet we want to see are on the horizon -- for example, NYC will renegotiate two cable and 12 technology franchise agreements in 2020. Learning from the example of Philadelphia’s Cap Comcast campaign example, New York could start organizing now to build a coalition, assess digital needs, compile community benefits demands, and grow public pressure for more responsive franchise contracts. The leadership of the City of New York has declared its support for a principled approach to broadband access, declaring its intentions to build and protect an open internet, and finance, proliferate, and maintain diverse models of ownership. The Mayor’s Office has also started building out free or low-cost options to some neighborhoods, yet the work is not complete. More public pressure on our elected officials can help place infrastructure where it is needed, listening to residents and their concerns in the process, and paying particular attention to communities that are dealing with multiple social and economic challenges, using the franchise negotiations as an opportunity to build awareness and demand for community broadband benefits. Beyond the public process of advocating for more equitable broadband infrastructure through government, however, people are also innovating new models and approaches for their own communities. Historically, most broadband has been built by the private sector without consideration (or regulation) around equity goals, leading to situations -- as in Detroit -- where certain populations simply do not have access to the means of digital participation. Diana Nucera explained how the Detroit Community Technology Project’s Equitable Internet Initiative is taking a different approach to building community broadband, training local residents to build their own internet infrastructure and using the process of design as an opportunity to shape it intentionally. The initiative asks key questions about who owns the shared fabric of connectivity, demystifying technology and increasing a sense of ownership and decision-making power by aligning our human infrastructure of relationships with the physical infrastructure of broadband. To inform experimentation through learning from existing models of community technology, Nucera -- and Dabriah Alston from Brooklyn’s Red Hook WiFi -- explained how those community networks have survived and thrived, offering alternative service to local neighborhoods and training local residents to own, govern, maintain, and make decisions about how they live with networked technologies. Participants also explored how new models of broadband distribution are expanding to include cooperatives, which would leverage different supply-demand equations by demonstrating that the typical “per-household” model offered by internet service providers is not the only way to provide broadband -- but to accomplish this, more knowledge-sharing, DIY tech and organizing skills, and different kinds of partnerships are needed. Participants shared their skills and knowledge, demonstrating DIY networking technologies like the “Portable Network Kit,” an assembly of inexpensive wireless networking tools as a tool providing a learning platform and a sandbox to experiment, play, break, and fix. Participants also explored ways to expand and scale community-based networks by creating “backhaul cooperatives:” collectively purchasing wholesale internet from Tier 1/Tier 2 providers and creating independent neighborhood and regional internet exchange points. Using this method to get to scale, and with people power built in for governance and accountability, participants argued, we could truly create an equitable internet. We need reliable public data to make decisions for the public good around funding, political representation, and resource allocation -- and increasingly, networked “smart” city technologies can offer new efficiencies and collective benefits by leveraging big data. Yet the misuse of data to profile, target and surveil is a matter of huge concern, especially for vulnerable communities. As the 2020 Decennial Census approaches, Steve Choi pointed out, we are facing the critical likelihood of undercounting, especially among traditionally underserved and marginalized populations. With a digital participation goal of 80%, we know that many under-connected areas will also be undercounted. Immigrant communities already feel nervous about participation, and more than ever given the threat of a Census question on immigration status. Meanwhile, federal funding for the Census has been dramatically reduced. Yet while undercounting is a major concern, so is ensuring that data collected by the Census Bureau will be kept private and secure, and that community organizations and advocates are equipped for the process and have capacity given data vulnerabilities and risks. There are many questions here to grapple with: What kinds of data collection interfaces and practices reduce risks? What agency can people exercise over participation? What is the role and capacity of CBOs to work with communities and their sensitive data? Meanwhile there are also broader questions around possible harms and risks due to flaws in public datasets and the misuse of our personal data, especially with networked and automated systems on the rise. Risks and harms to our digital bodies are greatest for those with the least amount of power. As community members, organizers, technologists, representatives, we need to be asking — how can we protect people who could potentially be harmed by technology or digital participation? As Una Lee pointed out, here’s a very dangerous and widely accepted idea that our data will be used without our consent whether we like it or not. The only alternative seems to be avoiding most technology altogether, which is becoming less of a viable option, especially with the rise of networked and automated systems. Many of us are just learning how algorithmic decision-making is already being used in cities, for example in the criminal justice system (evaluating flight risk; evaluating eligibility for programs offering alternatives to incarceration; sentencing decisions); by social services (child welfare offices; public benefit allocations); to create public school rankings and admissions systems; and for municipal systems like public safety, trash collection and recycling. There are big questions around the models and proprietary algorithms used to conduct these automated processes: whether they are public or private, what right people have to contest or examine or challenge automated and algorithmic decision-making. Furthermore, without review, some uses of big data and predictive analytics may legally violate anti-discrimination requirements. Using Lee’s suggested framework of “consentful technology,” if we know we should have control over what happens to our physical bodies, shouldn’t we also be demanding to have control over what happens to our data bodies? We are told that as users, we should be using secure communication tools, setting up 2-factor authentication, being careful where we share our information — just as how to prevent assault we shouldn’t wear revealing clothing or walk down dark alleys, and we should put our trust in police and prisons. Instead, what would it take to make consent foundational to the applications, services, and data policies we’re creating? The answer can’t come just from the tech sector. Collectively, we need to take an intersectional approach, centered around those who could be most adversely impacted: by asking questions together, we can see that we all hold pieces of the answer. 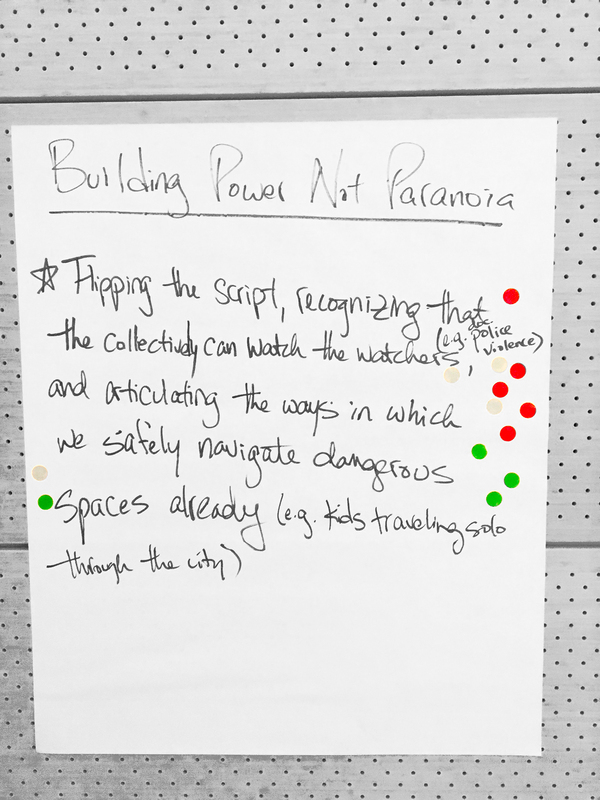 One approach is “Power not paranoia,” a framework developed by Mariella Saba for the Stop LAPD Spying Coalition in partnership with the Los Angeles Community Action Network and the Our Data Bodies Project. Saba designed the framework to get people thinking affirmatively about how traditionally marginalized communities already have power, and to talk about how many communities are already pushing back against oppressive systems and building momentum. While there is some power in paranoia (awareness of how data collection is impacting the life of a person or a community), communities can also create collective strategies and tactics to build power together. Meanwhile, some cultural institutions are working to ensure responsible data practices and protections. Public libraries, longtime practitioners of ethical data stewardship, are moving to fill a gap in education about digital privacy protection, tactics and tools. Librarians meanwhile are noticing a shift: many people are starting to take more interest in privacy as a public good. 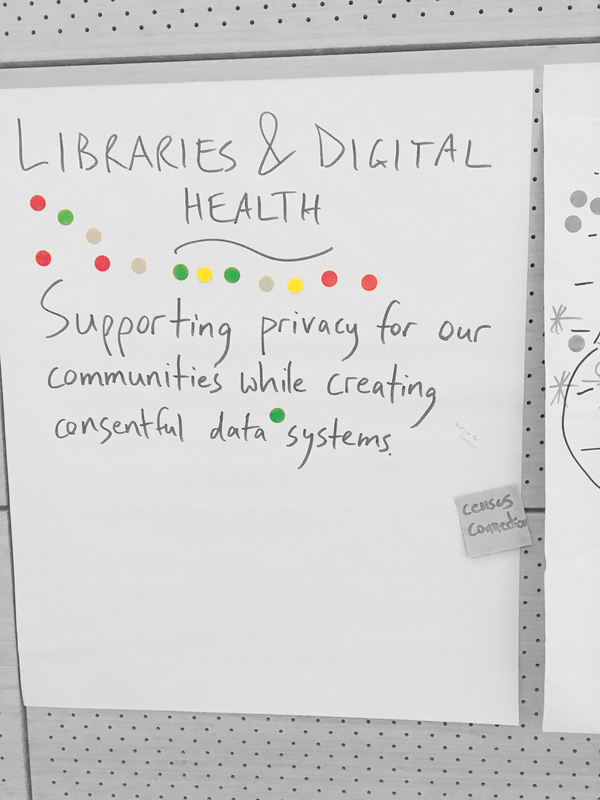 Librarians have ethical mandate for principled interaction with data, so libraries can be central to building healthy digital communities as trusted institutions. However, Lee and Peralta also cautioned that it takes time to build alliances that center authentic relationships. You have to negotiate priorities and roles, participate in processes which can also take time. In the long run, though, it allows leaders to have a seat at the table when you can’t be everywhere at the same time. Their advice on alliance building included scaffolding the action of the alliance -- starting with one thing (one event or concrete action), not starting out with a ten-year plan -- accomplish one thing together and then take time to reflect on how things played out and what could be improved. Lee and Peralta further recommended finding balance and building relationships among local groups, especially in communities of color, so that communities are prepared for when outsiders come in, and have a collective strategy to ensure that outside interventions benefit all. Expand advocacy on technology issues to non-tech groups (faith-based, immigrants’ rights, arts, etc.) who are impacted by technology. Prioritize public awareness -- explain to people why they should care. With these guiding strategies, and moving toward a collective vision of empowerment around digital equity, we have an opportunity right now to create momentum and harness public and private power to create the digital society we want. Check back at www.digitalequitylab.org for our events, convenings, and announcements. We look forward to carrying the momentum and excitement of a positive vision for the changes technology can bring, if we take this opportunity to work together with intention and shared principles. "DEL-Launch Report: The power is here, the time is now"
Article by Zack Quaintance at govtech.com: "The effort, based out of The New School, is led by Maya Wiley and addresses equitable models of digital access, digital equity frameworks for online issues, and the ways that smart cities create both benefits and risks for vulnerable communities."